A Wedding in Florence is a wonderful idea for a romantic destination wedding. 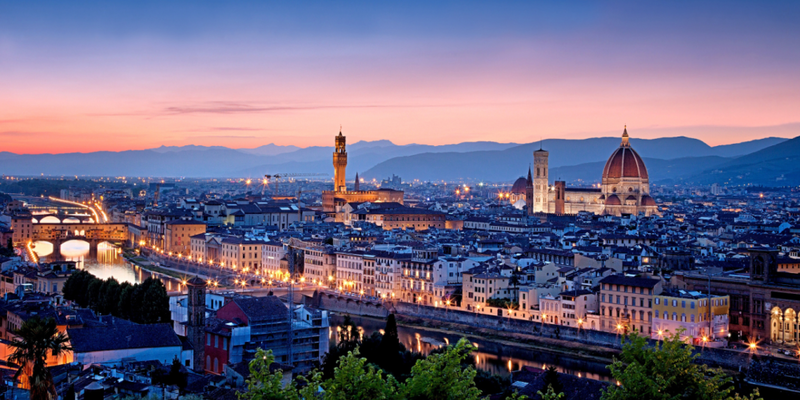 Surprisingly small, Florence doesn’t look like any other city in the world. Known by everyone as the ‘Culla del Rinascimento’ it is the birthplace of a lot of personalities like Macchiavelli, Michelangelo, Leonardo and Medici family. Florence is a romantic place, with cosy alleys, full of designer boutiques, artisan workshops, and small cafés that every year receive thousands of tourists recalled by the charming beauty of this city, that beside being a treasure chest for architecture and art is also the capital city of ‘mangiar bene’ (translated as ‘eat well’). When thinking about Florence comes the image of melange red rooftops, cypress in row, churches steeples and stone palaces that evoke a thousand tales from its medieval past clearly to our mind. –Duomo, that appears with its majesty turning the corner of a small street, where we suggest to walk up the 463 steps to the top of the Cupola del Brunelleschi, the view will recover the effort. –Galleria degli Uffizi, that hosts many impressive masterpieces such as the Venere by Botticelli and Adorazione dei Magi by Leonardo Da Vinci. Uffizi, Palazzo Pitti and Palazzo Vecchio are linked by the Corridoio Vasariano an extraordinary and elevated covered passageway, that goes on for around 1 kilometre, designed by Vasari for Cosimo I in 1565, to walk freely and privately between these three construction, to avoid walking down the streets. – Ponte Vecchio is probably the icon of Florence, the only bridge that remained untouched after the bombing during the Second World War, this was allegedly, according to hearsay, because of an express order by Hitler. It is a Medieval stone closed-spandrel segmented arch bridge over the Arno River which until XVI century was characterised by butchery shops, but Ferdinando I because of the bad smell ordered them to be replaced with goldsmith’s shops that have held on over the centuries and which are now the signature shop of the bridge. The bridge is popularly connected to the idea of love and lovers as it is an extremely romantic spot, especially at sunset. The Galleria dell’Accademia, Giardino di Boboli, la Basilica di Santa Croce are some of the other places you should, or better must, visit while in Florence. This city will surprise you even if only walking down the streets and alleys, where you will find by yourself less known, but as well striking and impressive, spots. Whatever you do, don’t miss sunset and the night view from the terrace of Piazzale Michelangelo, looking over Florence and Tuscan Landscape. Contact Italian Wedding Designer for your dream Wedding in Florence!